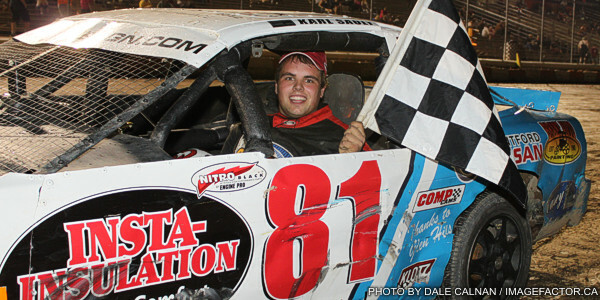 by Tommy Goudge (@TommyGoudge) August 3, 2012 – Ohsweken Speedway remembered a fallen friend on Friday night with the annual “Art Hill Memorial 42” for the HRW Automotive Mini Stock division, and Karl Sault emerged with the big win. Travis Cunningham won his third Corr/Pak Merchandising Sprint Car feature, while Mike Thorne returned to the Engine Pro Racing Winner’s Circle for the first time in more than two years after a win in the Lighthouse Tattoos Thunder Stock feature, and Davey Boughton won the Pierced Parts Bombers race. Jamie Turner and Travis Cunningham started the Sprint Car feature up front, and Cunningham took the lead early and opened up a gap. Glenn Styres led the championship chase entering the night, but chose to travel to Knoxville Raceway for the 360 Nationals this weekend, leaving the lead up for grabs. Turner gave chase, while side-by-side action ensued behind him. Keith Dempster started on the outside of the sixth row, but didn’t stay there long as he moved up to contend for a spot in the top five. Cunningham held the lead through a couple of caution periods, including a red flag for hard flips in turn three for Jamie Collard and Dave Dykstra. Both drivers emerged from their heavily damaged machines uninjured. Cunningham went on to win his third feature in less than a month, with Turner settling for the runner-up spot, followed by Dempster, Scott Kreutter, and Chris Steele. “It’s never going to get old,” Travis said of winning for the third time. “I can’t believe I got three this year. I was just hoping for one, and now I’m the point leader, I can’t believe the way this season is going. I’ve got to thank the track crew for making a tacky surface. Heat races for the 19 car field went to Scott Kreutter, Mitch Brown, and Travis Cunningham. Ryan Beagle and Dave Bailey began the Thunder Stock feature on the front row, but all eyes were on the back of the pack, where many of the fastest drivers started. As many as five or six drivers were sometimes involved in the race for the lead, until Mike Thorne and Jack Myers got out front. Thorne utilized the outside groove, with Myers on the inside. Thorne was confronted with trying to put a lap on Luke Greiner with less than two laps to go, and had to dive to the inside in turn three to get by, allowing Myers to get beside him. The two raced side-by-side to the checkered flag, with Thorne taking the win by less than half of one car length. Myers settled for the runner-up spot, followed by Brad Herron, Wyatt Van Wart, and Pete Reid. The win was Thorne’s first since June 25, 2010, as he won the 2011 Thunder Stock championship without going to the Engine Pro Racing Winner’s Circle. “It feels so good. I didn’t know the car still had it in it,” Thorne said afterwards. “The lap car got in my line and I had to do something. Heat races for the 27 car field were claimed by Bryce Richardson, Brad Herron, and Chris Dickie, while Lee Winger won the B-Main. 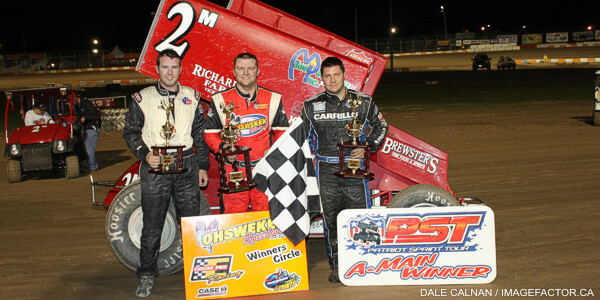 Dave Goodacre and Dan Erskine began the longest feature event of the season for any division at Ohsweken on the front row, after the pole position was left open on the pace laps in honour of Art Hill, the only driver to pass away in competition at the speedway. Karl Sault quickly asserted himself out front and took off, while 35 laps clicked off before the first caution flag slowed the field. Sault had five lapped cars between himself and second place Jeremy Hughes when the race started again, but saw that cushion disappear when a melee in turn three brought out another caution. Sault was not to be denied though, and took a convincing win, followed by Hughes, Jason Lungaro, Steve Miller, and Mark Czuba. “The temperature was starting to creep up a bit,” said Sault after the race. “I was hoping for that first caution so I could cool it back down. Steve Miller, Karl Sault, Jason Lungaro, and Chase Hess won heat races for the 30 car field, while Brandon Janssens won the B-Main. Davey Boughton had to borrow a car from Monday night feature winner Lee Hils after his own had mechanical issues, then survived early carnage in the feature race to emerge with his second win of the season in the Pierced Parts Bombers event. Max Chechalk chased him to the line, followed by Mark Bazuin, Joe DeBoer, and Erik Sepper. Boughton’s win brought him to within 11 points of championship leader Chechalk. Heat races for the 14 car field were claimed by Joe DeBoer and Brady Longboat. Gales Auto Aftermarket presents “Haldimand County Night” next Friday, August 10. Spectators showing proof of residence in Haldimand County will be admitted to the speedway for half price this week. The Corr/Pak Merchandising Sprints, Lighthouse Tattoos Thunder Stocks, HRW Automotive Mini Stocks, and Pierced Parts Bombers are all part of Friday Night Thunder on August 10, along with the return of the Vintage Cars. Gates open at 6:00 with racing starting at 7:45! Sale of advanced reserved seat tickets for the 8th annual Canadian Sprint Car Nationals September 14 and 15 at Ohsweken resume on Tuesday, August 7! Please visit www.OhswekenSpeedway.com and call 1-888-720-RACE to order yours today! 1. 49x Scott Kreutter (Alden, NY), 2. 5d Dave Dykstra (Port Colborne), 3. 11 Jamie Turner (Caistor Centre), 4. 49 Todd Hoddick (Cheektowaga, NY), 5. 27h Tom Huppunen (Fenwick), 6. 07x Dain Naida (Tecumseh, MI), 7. 9nz Havard Daniels (Coatesville, NZ). 1. 11r Bryce Richardson (Port Colborne), 2. 00x Derek Miller (Ohsweken), 3. 77 Brett Rodwell (Caledonia), 4. 29 Jim Gracey (Dunnville), 5. 48 Mike Graham (Caledonia), 6. 84rk Ryan Beagle (Vittoria), 7. 00 Robbie General (Ohsweken) DNF, 8. 4 Brittany Gyokery (Jarvis) DNF, DNS. 85h Luke Greiner (Barrie). 1. 1 Chris Dickie (Brantford), 2. 28 Jim Lampman (Caistor Centre), 3. 33t Cory Turner (Caistor Centre), 4. 55 Mike Thorne (Caledonia), 5. 5h Pete Reid (Niagara Falls), 6. 33m Jack Myers (Wainfleet), 7. 2 Lee Winger (Caledonia), 8. 04 Wyatt Van Wart (Cambridge) DNF, 9. 10 Jake Brown (Brantford) DNF. (10 laps – Top 6 finishers transferred to A-Feature) 1. 2 Lee Winger, 2. 04 Wyatt Van Wart, 3. 17 Rob Disher, 4. 68 Aaron Turkey, 5. 4 Brittany Gyokery, 6. 13 Kacey Huffman DNF, DNS. 00 Robbie General, DNS. 10 Jake Brown, DNS. 85h Luke Greiner. 1. 79 Steve Miller (Paris), 2. 27 Dan Stewart (Hamilton), 3. 99 Robin Elliott (Woodstock), 4. 11 Mike Giberson (Caledonia), 5. 66 Brandon Janssens (Woodstock), 6. 4 Jason Coutu (St. Catharines), 7. 55 Rob Slater (Dundas), 8. 44 Dale Cooke (Hamilton). 1. 81 Karl Sault (Dundas), 2. 265 Mike Evers (Caledonia), 3. 777x Steve Hess (Ohsweken), 4. 02 Mark Czuba (Burlington), 5. 64 Doug Erskine (Hamilton), 6. 5 Rick Robinson (Brantford), 7. 69 Rob Twitchett (Dundas), 8. 92 Matt Pleil (Kitchener). 1. 7 Jason Lungaro (Hamilton), 2. 6 Trevor Goulding (Welland), 3. 38 John Cote (Hamilton), 4. 12 Jonathan Ayrton (Hamilton), 5. 53x Rodney Rutherford (Waterdown), 6. 84 Dale Gyokery (Jarvis) DNF, 7. 22 Brittani Myers (Hamilton) DNF. 1. 7x Chase Hess (Ohsweken), 2. 69e Dan Erskine (Caistor Centre), 3.05 Dave Goodacre (Brantford), 4. 10j Jeremy Hughes (Burlington), 5. 01 Mark Da Silva (Flamborough), 6. 53 Sarah Rutherford (Dundas), 7. 77x Ethan Martin (Ohsweken). (10 laps – Top 10 finishers transferred to A-Feature) 1. 66 Brandon Janssens, 2. 64 Doug Erskine, 3. 01 Mark Da Silva, 4. 55 Rob Slater, 5. 5 Rick Robinson, 6. 84 Dale Gyokery, 7. 53x Rodney Rutherford, 8. 44 Dale Cooke, 9. 4 Jason Coutu, 10. 53 Sarah Rutherford, 11. 22 Brittani Myers, 12. 69 Rob Twitchett, 13. 92 Matt Pleil, 14. 77x Ethan Martin. 1. 42 Joe DeBoer (Hagersville), 2. 6 Wayde Thorne (Waterford), 3. 16x Dwight Staats (Ohsweken), 4. 5 Kathi Dickie (Brantford), 5. 199 Frank Turkey (Ohsweken), 6. 007 Ian Myerscough (Burlington), DNS. 21x Erik Sepper. 1. 66 Brady Longboat (Ohsweken), 2. 18x Davey Boughton (Carlisle), 3. 16 Jeremy May (Hamilton), 4. 21 Mark Bazuin (Caledonia), 5. 23 Dusty DeBoer (Hagersville), 6. 97 Max Chechalk (Hamilton), 7. 707 Danny Shantz (St.
Agatha), 8. 21x Erik Sepper. 50 LAPS FOR LIGHTHOUSE TATTOOS THUNDER STOCKS, HRW AUTOMOTIVE MINI-STOCKS, & PIERCED PARTS BOMBERS, PLUS VINTAGE CARS ADULTS $12, SENIORS AND STUDENTS $10, KIDS 12 AND UNDER FREE! SPECTATOR GATES OPEN @ 6:00 P.M., RACING @ 7:45 P.M. Copyright © Ohsweken Speedway and Image Factor Media.